On Friday morning, Anchorage got a jarring reminder of the importance of seismic building codes. Alaska's no stranger to earthquakes. The Pacific plate is headed northwest, but that oceanic slab is too heavy to override the more continental North American plate. But those 2.28 inches (57mm) of plate per year need to go somewhere, so the slab dives. Tectonic forces we're still working to fully understand pull it down into the mantle. And as it goes, of course, earthquakes and volcanoes happen. The M 7.0 earthquake that struck Anchorage occurred in that slab, 27 miles (44 km) down. The rupture happened a mere 8 miles (12km) from the city. The large size of the earthquake, plus its proximity, meant that Anchorage and its surrounding areas saw some pretty heavy-duty shaking. The photos and videos that emerged in the aftermath were jaw-dropping: cracks that dwarfed cars in roadways, buildings split nearly in two, tiles raining down from school ceilings. Being caught up in a tectonic event of this magnitude is terrifying. Earthquake waves cause water pressures to increase in the sediment and the sand grains to lose contact with each other, leading the sediment to lose strength and behave like a liquid. The soil can loose its ability to support structures, flow down even very gentle slopes, and erupt to the ground surface to form sand boils. Many of these phenomena are accompanied by settlement of the ground surface — usually in uneven patterns that damage buildings, roads and pipelines. 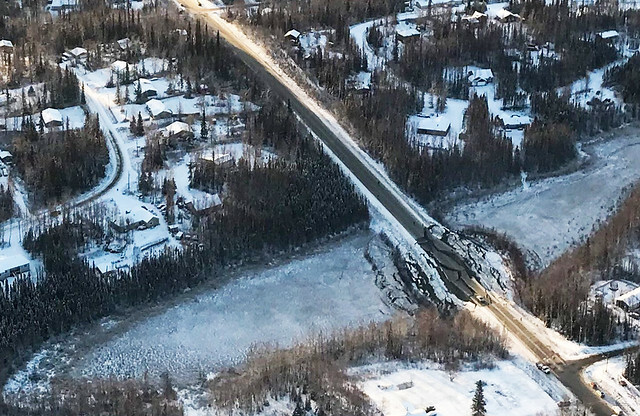 Possibly the most dramatic example of the damage that soft, watery soils being shaken by seismic waves can cause is Vine Road, south of Wasilla. You can see how each side of the road built on solid ground has survived virtually unscathed, but the bit resting on fill in the low area has come completely apart. On the ground views of the damage are astounding. Liquefaction and landslides cause some of the worst damage in quakes. The USGS has rolled out a new ground failure tool for assessing where and how severe these failures might be, which can give the public, municipalities, and government agencies a look at the most at risk areas in near real time. This is what ground failure hazards Anchorage and its environs might expect from the 2018 Anchorage Earthquake. Most of the impact will be to infrastructure, most of it coming from liquefaction, although there has been some damage from landslides, and aftershocks over M 6.0 could cause new ground failures or reactivate those caused by the mainshock. Earthquake-triggered landslides and liquefaction, collectively referred to as ground failure, can be a significant contributor to earthquake losses. The USGS Ground Failure (GF) earthquake product provides near-real-time spatial estimates of earthquake-triggered landslide and liquefaction hazard following significant earthquakes worldwide. We developed this product to provide initial awareness of the overall extent and importance of potential landslides and liquefaction, and to indicate areas in which they are most likely to have occurred. It takes time for first responders and experts to survey the actual damage in the area, so our product provides early estimates of where to focus attention and response planning. Though our models provide regional estimates of landslide and liquefaction hazard triggered by this earthquake, they do not predict specific occurrences. The more tools we have in our seismic kit, the better. I'm really excited by the potential for this one to aid in rapid, effective emergency response when dangerous quakes occur. What's next for Anchorage? There's a minuscule chance of a larger earthquake happening, but the USGS estimates there's only a 1% chance of anything M 7.0 or larger happening in the next week. We can't know for sure we've already experienced the mainshock until the sequence concludes, but we probably have. So Alaskans can expect a series of aftershocks, which will gradually taper off. The overall trend will be toward smaller and fewer shocks as time goes on, although a large aftershock may briefly cause the numbers to spike again. But the ground will go quiet again. Anchorage will fix the damage. And its strict seismic building codes will help it prepare for the next large quake, which is never too many decades away in such an active tectonic zone.